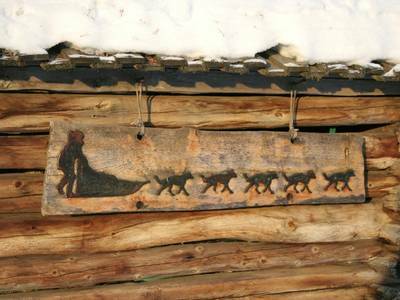 This dog sledding centre is owned and run by Sven Engholm, who is very probably Scandinavia's greatest ever musher. Sven is a man who was born to run sled dogs. He and his team have created something really special here in the woods outside the town of Karasjok. 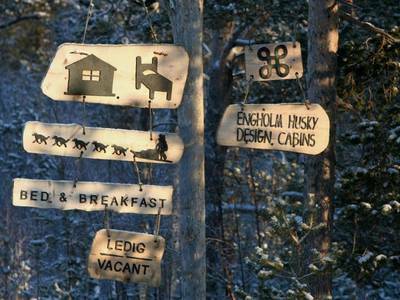 If you've ever wanted to try a genuine dog sledding experience then this is the place for you. I always long for untouched nature - the great Finnmark plateau. Travelling in this free nature, with sled dogs gives a good life. 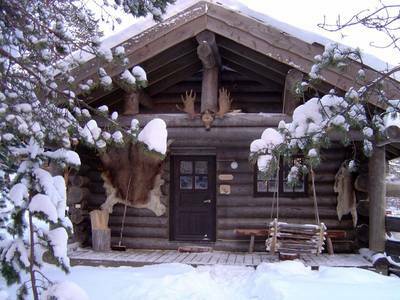 I have had the pleasure to design and build our log houses and all interior furnishing. Everything is handmade with local natural materials such as wood and stone. I love sharing all this with others. Join Sven Engholm, one of Scandinavia’s greatest mushers on a dog sledding adventure in Karasjok, Norway. Time spent with this living legend and these beautiful dogs puts you in the company of the best, for the greatest dog sledding experience possible. Authenticity explains the popularity of the Karasjok husky safari, which was created by Sven Engholm, (Scandinavia's 11 times winner of the Finnmarkslopet longest dog sled race in Europe and also a top ten finisher in the Iditarod 1800km North American mushing race). The passion for mushing and the excitement of the trail is simply contagious in his company. Your wilderness husky dog adventure lasts three days and two nights, covering up to 25km to 50km each day. With breathtaking winter scenery as your backdrop, look out for local wildlife such as reindeer and moose in their natural habitats. 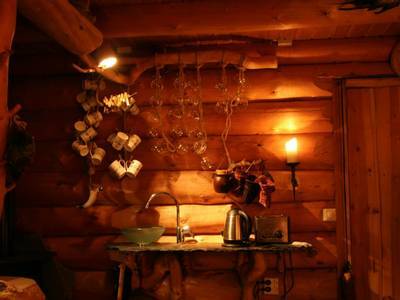 Your accommodation is a mix of log cabins at Engholm Husky Farm (6km from Karasjok). A launch pad for some of the world's best dog sledding - life is all about the dogs and sledding here, where fifty resident huskies are the main form of transport. 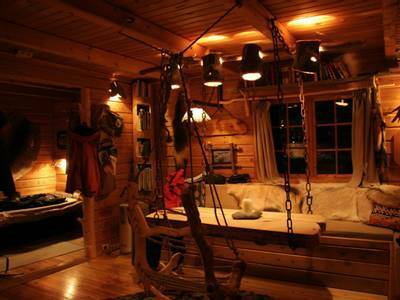 In keeping with the intimate and unique feel of this trip, there are only eight cabins at the husky farm. Each cabin has been built by hand and tastefully filled with handcrafted pieces, giving a combination of comfort with traditional Sámi decor. Whilst out mushing, if your host discovers a particularly unusual or useful piece of wood, he marks it on his GPS and it will be retrieved later. The wood is then crafted into something that adds to the unique beauty of each cabin. Admire lampshades made from bird feathers, seats and dining tables hung by ropes from the cabin ceiling and reindeer skin stool covers - everywhere you look there is something special that brings the great outdoors indoors. Suitable for: Ages 15+ with a good level of physical fitness. See our terms for further information. 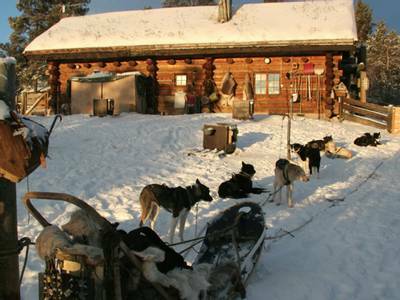 Flights to Ivalo, Finland are followed by taxi transfer to the Engholm Husky Farm in Karasjok, Norway. The transfer takes approximately two to two and half hours. On arrival, you will be invited to a welcome meeting, where your guide will talk you through the details of the exciting days to come. Dinner will be served at the lodge. This morning is spent getting ready for your two nights in the remote wilderness of Norwegian Lapland. You have a chance to meet your team of up to six dogs that you are going to drive on your husky safari. The number of dogs you have depends on your guide's expert judgment. The guide needs to assess your ability to handle and drive the sled, whilst taking the likely conditions on the track into consideration. The guides reserve the right to make the final decision on a guest's handling ability. Initially, you may be asked at first to ride in tandem and then progress from there. As soon as your sleds have been carefully packed and prepared, you're all set for your safari. On leaving the husky farm, you immediately come across a hilly stretch that instils confidence and respect for your team from the outset. You can help the dogs by pushing off with your feet against the upward slopes. This adds to the thrill of the adventure and gives a sensation of real satisfaction as the dogs respond favourably. The journey to your accommodation across lakes and frozen marshland is a great introduction to the wonder of this winter landscape. For the next two nights, you will stay in remote wilderness camps or cabins depending on the weather conditions. Wherever you stay, there will soon be a fire blazing as your group work together preparing a delicious dinner. In this remote environment, you can enjoy the peace all around, miles and miles from the rest of civilisation. On safari, the route remains flexible so that your guide can select the best trail, determined by the local weather. If it is deemed necessary to spend more than one night in the same camp/cabin, this allows you to pack light and potentially cover greater distances. Lunch each day is cooked over an open fire. Along the trail, you are likely to encounter indigenous wildlife, as this area is an important winter pasture for the reindeer of the Sámi herders. The local guides love to share their knowledge of wildlife and outdoor living. For a real insight into your surroundings, just have a friendly chat anytime. There are few experiences that compare to mushing your own team of dogs on their home turf. Travelling deeper into the wilderness, the gentle swish of the sled and the padding of eager paws as the only sound. After two days exploring, spend a second night in the wilds before the long mush back to Engholm Husky Farm. The return route is well known for sightings of wild moose, so stay alert and you may well catch a glimpse of these magnificent beasts. Farewell dinner waits at Engholm Husky Farm on your last night - a relaxed evening usually spent reflecting back on the adventure and sharing stories of the trip. Return to the airport for your flight out of this unforgettable landscape. 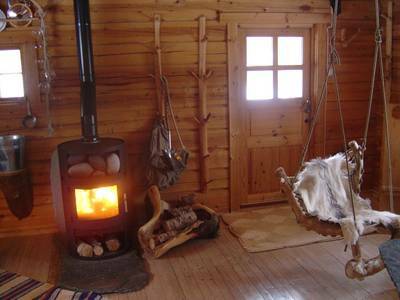 Karasjok is the centre for Sámi culture in the wilds of Lapland and Engholm Husky Farm and cabins are located 6km from the main village. 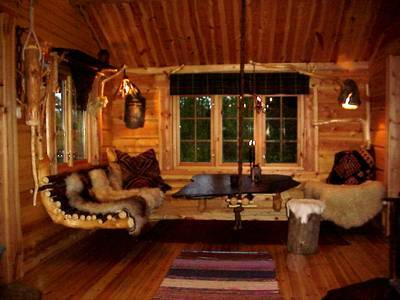 This accommodation, situated in the remote forests of North East Norway, provides a wonderful introduction to the Sámi culture within this remote region. 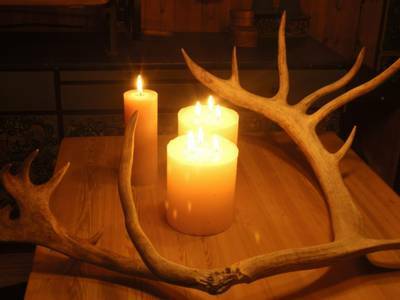 All cabins are decorated with local items that the owner (and resident interior designer) Sven has collected and crafted from natural materials scavenged from nature in the area around the lodge. When out mushing, your host may see a piece of wood that would make a coat hanger, a shelf, a lampstand, anything really. He uses his GPS to pinpoint its location and then picks it up next time he’s passing and fashions it into something both useful and remarkable. Lampshades made from bird feathers, comfy seats and dining tables hanging by ropes from the ceiling, reindeer skin stool covers and much, much more. Everywhere you look there is something that reflects living here in the Arctic. Your stay is made extra special by dishes served in the cosy dining area including locally sourced reindeer and fish. Aside from the unique collection of log cabins the lodge is also a working husky farm that is home to about 50 working dogs - so be prepared for the wolf-like calls of the dogs in the morning. There are only eight individually designed cabins here, each with Wi-Fi access. Each of these cabins has sleeping facilities for between two and six people, with the majority having log fireplaces and their own toilet and shower - those without, have access to a large bathroom in the main building. The lodge also offers a sauna and a hot tub, with intoxicating views of the surrounding scenery. If you can't quite bear to leave Karasjok just yet then we can arrange for you to extend your stay in order to take advantage of the other activities on offer here. Your extra night or nights will be spent in one of the cabins (based on two people sharing) and includes breakfast, a packed lunch and your evening meal. Engholm Husky Centre is renowned for its enthusiastic sled dogs and racing heritage. During one of your free days, you may wish to further experience the joys of dog sledding and take the trails once again for another thrilling safari into the wilds. We will be more than happy to arrange an additional full day safari for you. If you book additional nights or have a free day during your holiday, you have the option to add on a guided cross-country skiing activity. This a much-enjoyed and traditional pastime in Scandinavia, and, once you have the hang of it, can be marvellous fun and a great way to travel across the snow-covered landscape. Reindeer are of huge importance in Lapland and if you have a free day or book additional nights on your Karasjok Adventure we would strongly recommend this activity. It will give you a unique and valuable insight into the lives of Sámi herders in this region. You will spend time at the reindeer pasture and encounter the animals whilst also having the chance to ask the herder any questions you may have. The dog sledging was excellent - very hands on and involved. The husky safari was excellent; the dogs were big and strong and the wilderness was breathtaking.